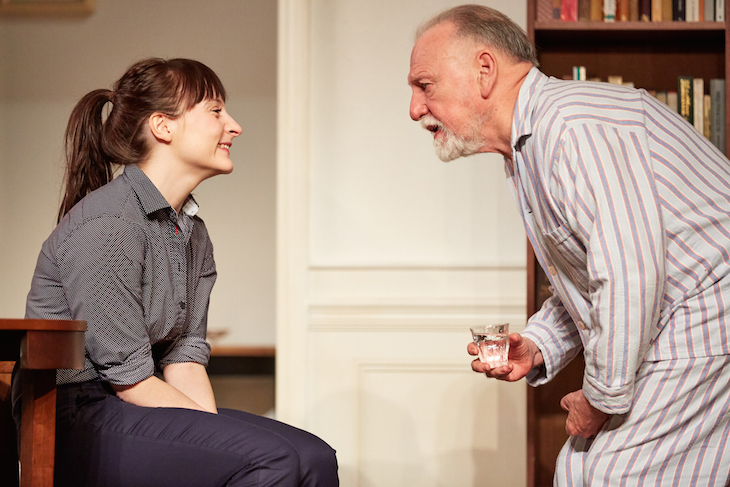 The daughter, Anne (Amanda Drew) and the father, Andre (Kenneth Cranham). Photo by Mark Douet. Time is topsy-turvy, your loved ones are shape-shifters and reality is impossible to grasp. 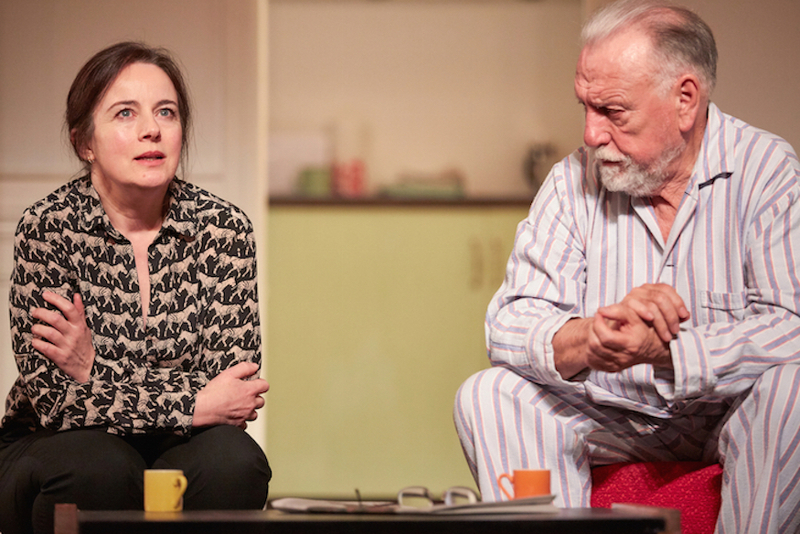 Such is the upside-down world of a dementia sufferer, brilliantly conveyed in Florian Zeller's The Father, now boasting its third run on the London stage at the Duke of York's Theatre. 'Immersive' is a theatre buzzword that so often indicates naff performances, lack of coherent structure and lots of aimless wandering. The Father schools these regrettable novelties as to what immersive really means. Different actors play the same role, scenes stop abruptly then get repeated later from an earlier point and the plot is constantly shifting. We're playing theatrical spot-the-difference, vainly trying to piece together some sense from all this bitty oddness. We no more know what's 'really' going on here than Alzheimer's sufferer Andre, played by Kenneth Cranham. Is his daughter Anne (Amanda Drew) divorced and moving to London or married and staying in Paris? Is the apartment depicted on stage his own or Anne's? Where's his other daughter, the absent Elise? This is like Kafka's Metamorphosis or The Trial, only possibly even more confusing. We don't have just one bizarre phenomenon to contend with, but a plethora of them. In the hands of director James Macdonald, these comparatively mundane issues become even more bemusing than a man waking up one morning as a giant cockroach. Andre charming the socks off his new carer, Laura (Jade Williams). Photo by Mark Douet. One great strength of this production is, surprisingly, its levity. We're not in a a dark Ggothic dungeon or a depressing kitchen-sink drama council flat but in a bright, airy room with high ceilings and light flooding through the window. Cranham can be movingly child-like and vulnerable, but also funny (if often cruelly so) and quite charming. One silver-lining to having no grasp of the past is that you can believe it was whatever you'd want it to be. Engineer? Pah! He'd rather have been a tap dancer or a magician in the circus. Yet Cranham's Andre, waking alone in an empty room, looks as bewildered and stripped bare as the most harrowing Lear in the forest. Drew's Anne, silently sobbing through reassuring smiles, is quite heartbreaking, and we spotted more than a few similarly wet cheeks in the audience after the final curtain. At moments, though, the charm fizzles out and the vulnerability fails to move. With bestselling novels like Elizabeth is Missing and films like Still Alice raising awareness of dementia, certain tropes have become overfamiliar: the accusations of theft by the downtrodden carer, the mix-up of the daughter and the mother, the hurtful preference of the absent sibling over the present one. While these repetitions may be entirely justified in their veracity, they bring parts of the play to a standstill. For the most part, however, The Father achieves the impossible: balancing unflinching misery and quiet humour. The Father is at the Duke of York's Theatre until 26 March. Tickets cost between £15-£75. Londonist saw this production on a complimentary press ticket.